If you read our Anthem preview that we pushed last week, you probably noticed it was kinda short. Well, there's a reason for that. EA put a separate embargo on the last of the 3 sessions during their preview event, and it just so happened that the last section dealt primarily with the endgame - what players could expect to do once they reached the peak of the loot treadmill. A lot of my thoughts on what I played hinged on what I saw of this "endgame", and so it didn't make sense to write around something and then have to write it all out again, but this time with actual details since the embargo had lifted. Go figure. I think I should expand upon the point I briefly made in the last article - that it didn't feel like Anthem had enough variety. When I said that, I meant that it felt like Bioware had designed much of the game without considering the Javelin's abilities. Most of the missions required us to take out a flood of enemies on the ground, or gather Echoes - some of them forced our party to stay within a very small area while defending a point from waves of enemies. I don't take too much of an issue with the former gameplay, but I do think that the standard "wait for waves to finish" trope just doesn't work with Anthem's inherently much more mobile gameplay. 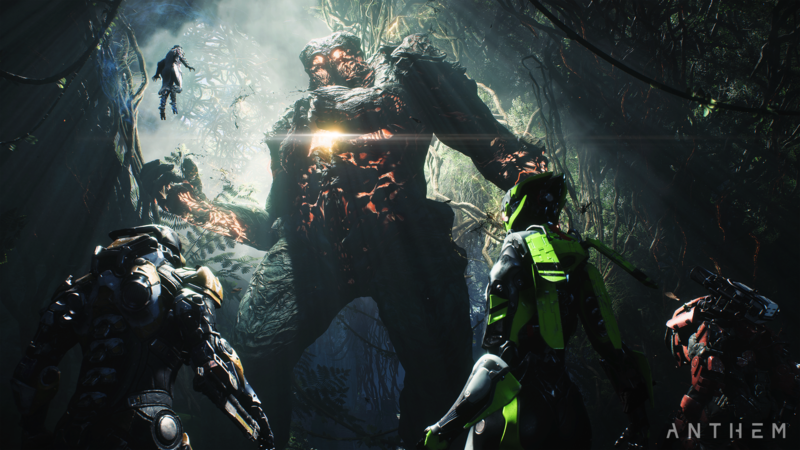 Anthem feels at its most refreshing when flying around the world in your Javelin, so any gameplay that forces you to stay within one area seems antithesis to the game's design. 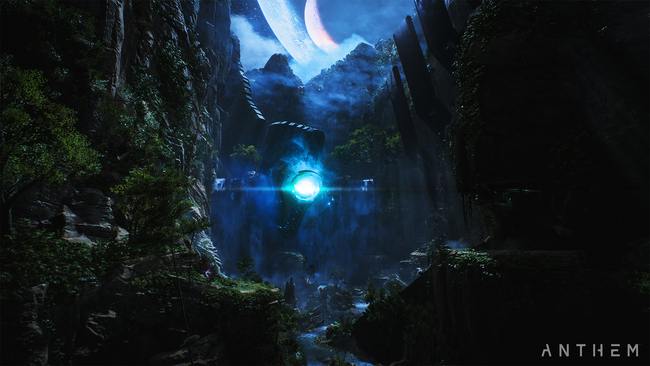 Some of the most fun that I had when playing Anthem occurred when you had to actually fly and explore an area in order to progress. Echoes are an interesting concept for this, even if they're simple. There's a puzzle that - by the time this piece goes live - you'll probably have discovered on your own while playing the VIP demo, and although it's not challenging, it does break up the gameplay and encourages exploration. 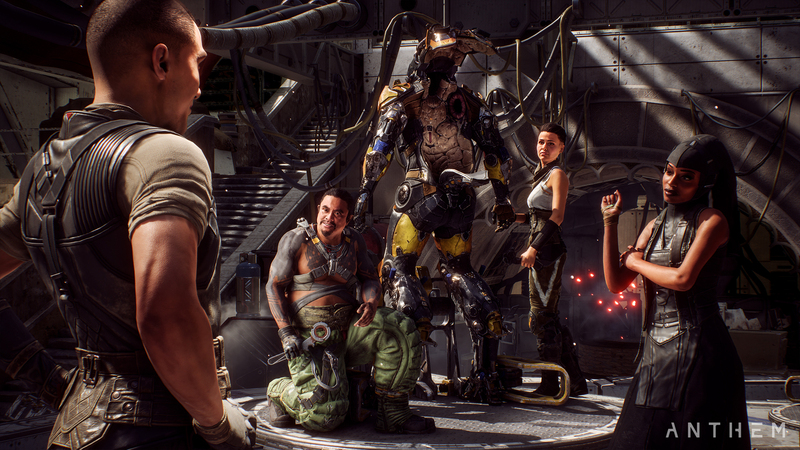 When we sat down to try out Anthem's endgame - Strongholds and Legendary Contracts - I was hoping to see more of that, and less of sticking in one spot and waiting for enemies to spawn. On one hand, Strongholds are definitely a step in that direction, even if I'm not sure if they lean into exploration enough. If you've played Destiny, I'd liken them to something almost like a Strike, though with puzzles. If you're familiar with Destiny 2: Forsaken, there's one particular Strike that takes place in the Dreaming City that comes to mind that feels very similar to the type of flow one might expect from these Strongholds in Anthem. Light puzzles, with enough mechanics that break up the monotony of regular combat. Between sections of combat, you're forced to explore for a way forward - it's fun stuff, but issues like the aforementioned swimming definitely got in the way of my own personal enjoyment. For what it's worth, they certainly feel significantly longer than Destiny's Strikes, too. The Stronghold that my party tackled dealt with dealing with a nest of Skorpion eggs, first discovering them (some enemies were plotting to use them for something), taking out the enemies, then delving deeper into a network of caves to discover the source of the eggs. Along the way, we had to gather what were essentially weighted keys that prevented us from flying, gather echoes, and take out waves of enemies. This all (predictably) culminated in a boss fight with a giant Skorpion, that summoned swarms of smaller ones to her side. It was an interesting fight - though one complaint I remember having is whenever you got a certain portion of her health down she would flee into the ceiling, and spawn enemies. I can't help but feel like it was a missed opportunity to force the players to chase her as she attempts to escape, instead of utilizing immunity phases instead. It certainly looked like we could fly after her, but an invisible wall stopped us. Although we didn't test it, another group ahead of us tackled a different Stronghold, and their boss fight seemed much more mechanically interesting compared to ours. While it still had immunity phases, during these phases they were forced to try and take out a couple of shield generators on either side of him, by shooting in-between a rotating metal barrier. Assuming that their path to that boss was similar to ours, I could definitely see myself enjoying the grind for each of these Strongholds at least a few times, though I still hope there's something like Destiny's Raids to grind towards, instead of just a treadmill with no real goal. The reason this concerns me centers on the fact that another portion of the game's endgame is classified as Legendary Contracts. There you'll tackle a series of battles with enemies across the open-world, and... not much else. It's definitely a shorter process than Strongholds, which makes sense since each Stronghold seems like they'll take around half an hour for most players, at the very least. My issues with Strongholds aside, they're fun, and I hope Anthem has significantly more of those than they do of Legendary Contracts. If the main game has at least a dozen or so of those come launch, I'll be happy. Doubly so if it's even more than that. Legendary Contracts, however, don't feel like they have much substance behind them - and it worries me that they seem to be targeted as an endgame activity, as such. 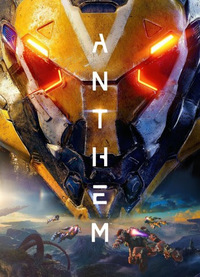 Despite my lukewarm reception in my first preview, I do want to stress that I want Anthem to impress come launch - between the small puzzles that could be found in the VIP Demo's content, and bits and pieces of hints towards larger content in the preview build, I want to believe that there's a lot more substance to Anthem's gameplay that we just haven't seen yet. Bioware seems to be keeping things like Anthem's story very close to their chest, so I'm hopeful that includes the type of unique content that I hope to see more of, too. Playing the game it's clear that the team cares about the game and its world, and I really hope that I can learn to care for it too.